What is a Front Control Range? vs. a Regular Slide-in Range? Front Control or a Slide-In Range? So you bought a slide-in range for your new kitchen. It has a nice look and the features you want. You will also see that beautiful tile backsplash without seeing the range controls on the backguard. Unfortunately, you found out the range will not fit in your existing cabinetry upon delivery. Now you have to start all over again. This scenario happens daily across the country. In this article, you will learn about the differences between freestanding and the two kinds of slide-in ranges - regular and front control. Then you will understand what you need rather than discovering it won’t fit when the delivery team is inside your home. First, let’s take a look at freestanding ranges. 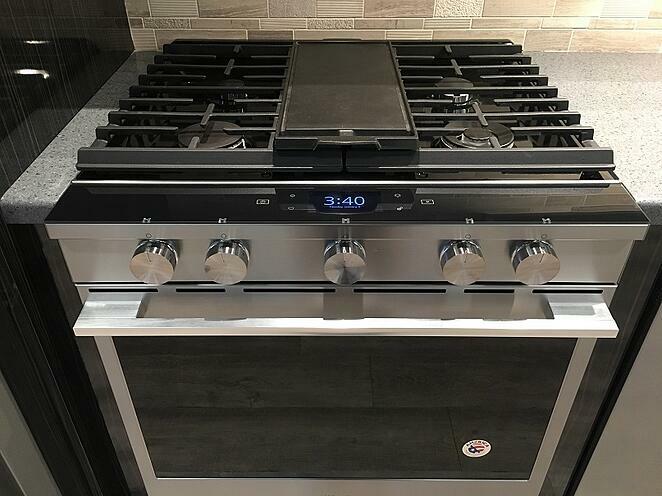 Freestanding ranges have a backguard with the oven controls and burner controls. They also have finished sides so they are a little more flexible with installation, and can be placed anywhere in your kitchen. 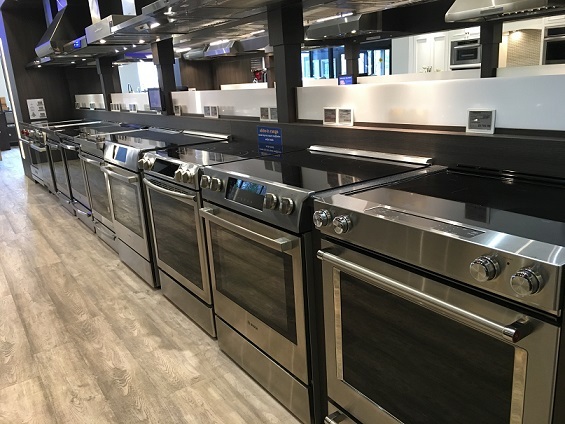 Freestanding ranges are available at much lower prices starting at $549-599 versus $1,000 for slide-ins. There is a more overall selection for freestanding ranges. Prices are also less expensive for freestanding ranges compared to a slide-ins with similar features. Slide-in ranges feature the burner and oven controls up front. They are also a little bit wider on top to overlap the countertop to create a built-in look. There are two main benefits of slide-in ranges: Style and Cleanability. However, while freestanding and slide-ins both require a 30-inch cabinet opening, slide-in models have unfinished sides. They are truly designed to be built-in between two cabinet sand are about 2 inches wider on top to overlap the countertop. One of the main benefits of the overlap is cleanability. Food and crumbs can’t drip down the sides like it can with a freestanding range. Also, when you push a slide-in range all the way back, there is about a 2-inch space behind the range. You fill this with countertop material. This allows a built-in look and the capability of being able to showcase your backsplash since there isn’t a backguard blocking it like a freestanding unit. Front control ranges are a mix of freestanding and slide-in. It does not have the backguard like a slide-in, so you can see your backsplash. It is also similar in price.  The first scenario of a range not being able to fit into an existing space could have been avoided with a front control range. Front control and slide-ins are used interchangeably, and that is a big mistake. The installation of a front control and slide-in is different. Unlike a slide-in, it also can replace an existing freestanding stove and requires the same opening. However, it is harder to clean with the seams on either side like a freestanding range. You can place a front control at the end of your kitchen because it does have finished sides. Now that we have an understanding of what these ranges are, let’s go over their major differences and why you would pick one over the other. 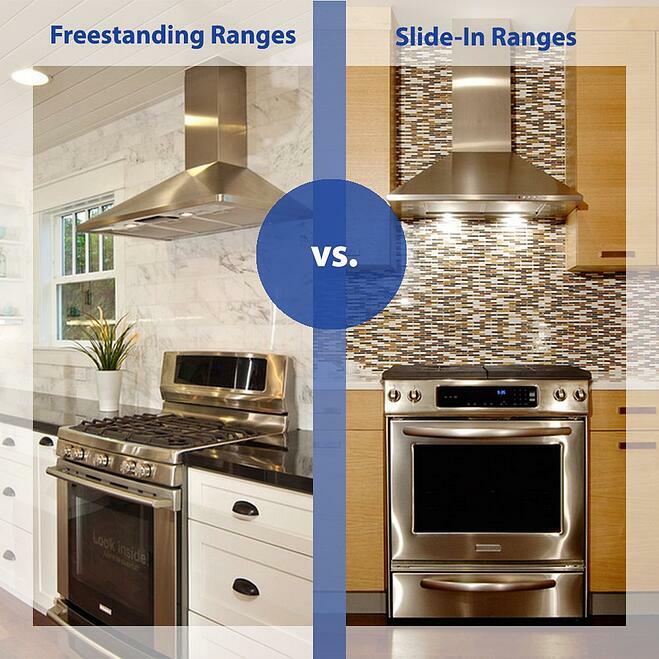 What’s the Difference Between Slide-In and Freestanding Ranges? The main differences between slide-in, front control, and freestanding ranges are their installation, their control location, and cleanability. 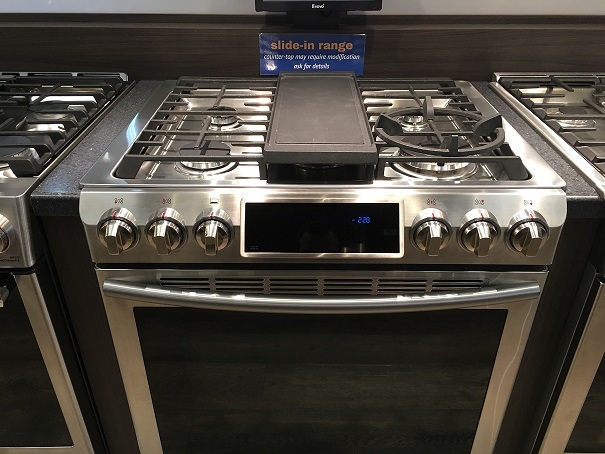 Below is an example of an electric slide-in range from Samsung, a front control range from GE, and a freestanding range from Samsung. Front control and regular slide-ins look similar but have different installations. When Should You Buy a Front Control vs. a Regular Slide-in Range? First, you do have more brand choices with a front control versus a regular slide-in range. Slide-ins are a better choice for new construction. They are much easier to keep clean than a freestanding or front control range. Front controls are better for replacing a freestanding range because it‘s a direct replacement without modifying counters or cabinets. If you like the cleanability of a slide-in and have an existing freestanding range, you will have to plan for additional installation for the range to fit. 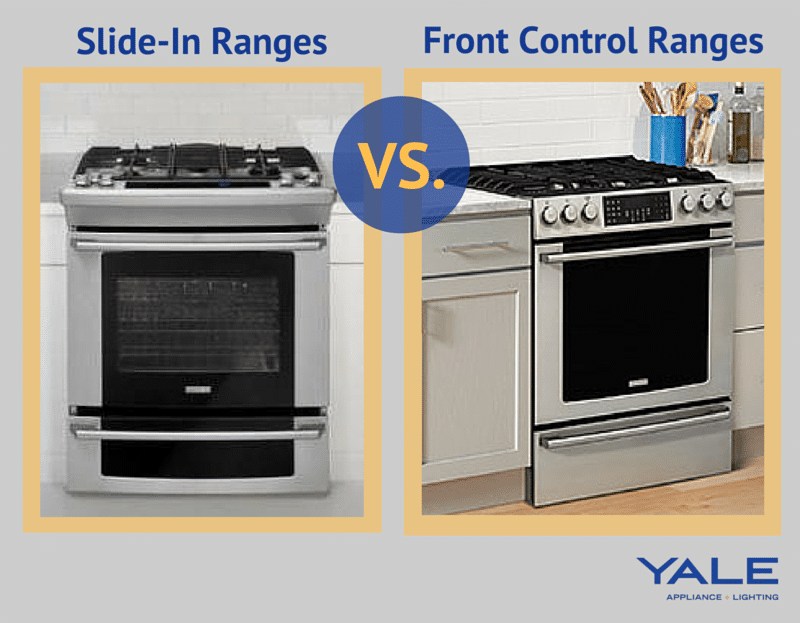 Should You Buy a Freestanding Range, Front Control or a Slide-In Range? The choice depends on price, style, and ease of installation. If you have designed a new kitchen with a custom backsplash, then a slide-in or front control range becomes a better option. Cleanability and built-in appearance for a slide-in range. Better selection and prices for a freestanding range. Safer to use due to all control are in the front control range. If you are a builder, first-time homeowner or on a budget, then a freestanding range is a good choice. 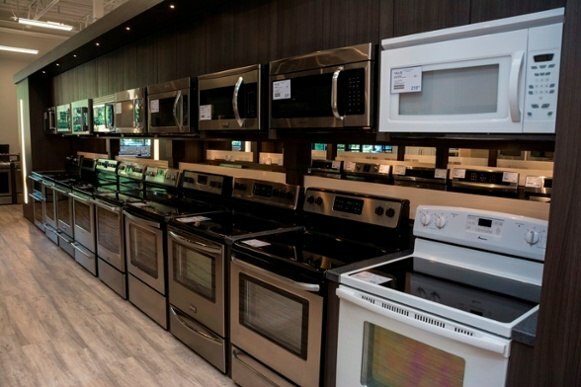 At $1,000, you can buy a full-featured range from Samsung or a less featured front control range from Whirlpool. If you have just renovated your space, slide-in and freestanding ranges are a good consideration for a cleaner look in your kitchen. Remember the difference between slide-in and front control ranges, especially if you replacing your existing freestanding range, is the installation. You do not want to find that out on delivery. When switching to a slide-in range, there is about a 2” space behind the range. You must either find a way to install a piece of countertop behind your range or purchase a metal filler strip that will fill this gap. If you try to install a slide-in range without this filler strip you will see a hole behind your range. Samsung slide in stove comes with a back filler. “I currently have a slide-in range but I want to purchase a freestanding range to replace it"
When switching from a slide-in range to a freestanding range, chances are you have a piece of countertop behind your range. You must have this piece of countertop removed before you install your freestanding range. If you install a freestanding range ins a slide-in installation, chances are you will see a large gap behind the backguard of the range. The unit will be pushed into the kitchen by a couple of inches as well. Are Slide-In Ranges More Expensive? Slide-In and front control ranges are usually 10-15% more expensive than a freestanding with similar features. 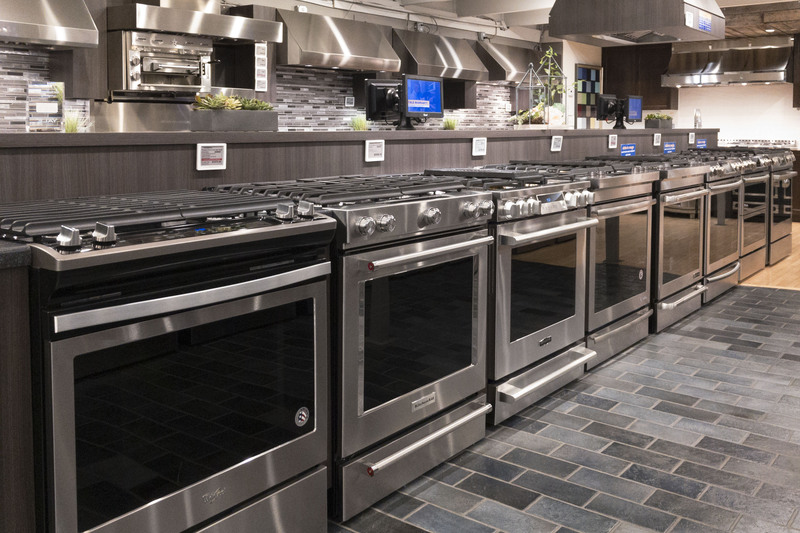 Want to learn more about the latest gas ranges and technology? 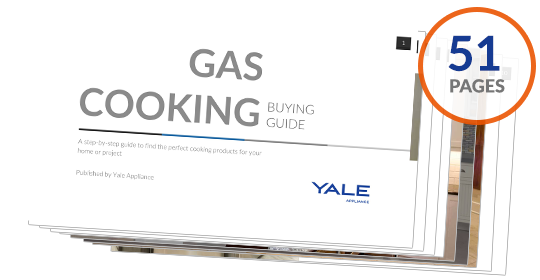 Read the Yale Gas Range Buying Guide with features, specs and detailed profiles of every major brand. Well over 510,000 people have downloaded a Yale Guide.